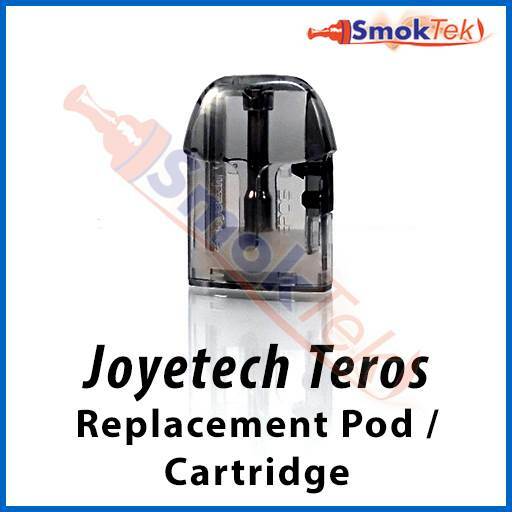 These replacement pods / cartridges are designed for the Joyetech Teros Pod vaporizer. The pod has a 2ml e-liquid capacity. To fill your new/unused pod with e-liquid, begin by gently pulling out the silicone stopper covering the side-fill port. Please note that only the indented bottom part of the stopper should be removed - do not attempt to remove the entire silicone stopper. Please do not over-fill the cartridge - about 80% full is ideal. Once full, insert the silicone stopper back into the pod and ensure it is securely sealed to avoid leaking. Set the pod aside for a few minutes to allow the cartridge to become fully saturated. This step helps minimize the chances of "dry burning" the coil inside whenever vaping on a new/unused cartridge. To begin vaping, simply slide the pod back into the Teros battery. Make sure the pressure sensor inside the battery and the sensor hole on the pod are aligned on the same side. The Teros is an automatic device - to turn it ON and vape simply draw/inhale through the mouthpiece. Price is for a single (1) pod / cartridge. Get a Quantity Discount when you buy 5 or more coils - view "Quantity Pricing" in the menu above. When using a new pod / cartridge, please set it aside for a few minutes after filling to allow the wicking material to absorb some of the e-liquid - this will help prevent it from burning when you fire the Teros. Do not over-fill the cartridge with e-juice - ~80% full is recommended. Avoid allowing the pod to get to less than 1/3 full with e-juice to avoid accidentally dry-burning the coil inside. The lifespan of your pod/cartridge will be dependent on frequency of use and type of e-liquid used. When the coil inside the pod wears down, it may begin to leak, and flavor and vapor production will noticeably decrease. Replace the pod with a new one if available.